Welcome to the Greenville Modern Quilt Guild! 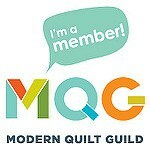 In 2015 we became an official chapter of The Modern Quilt Guild. We welcome guests to our monthly meetings and Sew-Ins at any time. If you are interested in membership, our dues are $50 per year and provide membership in the The Modern Quilt Guild, with all of its perks and resources. We look forward to meeting new quilters, young or old, new or advanced, so please join us! Our meetings are held on the first Saturday of the month at St Giles Church Fellowship Hall, 1021 Hudson Rd., Greenville, SC 29615 . 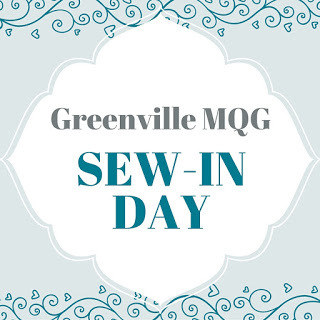 The meetings are from 1-3 pm and consist of a short business meeting, Show and Share, and an educational and/or inspiring program on Modern Quilting. Be sure to check our Meetings and Activities Page for changes in our regular schedule and meeting programs. You can find our By Laws here. All of our activities are optional! Participate in as few or as many as you like! Our Sew-Ins are held at the Bernina Store, 2310 East North Street, Greenville, SC 29607. They are informal gatherings, where we meet to visit and work on our own projects. Admission is a half yard of fabric, purchased at the store, which is raffled off to one lucky participant. Check our Meetings and Activities Page for dates and times. Each month we provide a block pattern for our members to make if they choose. It's a great way to try a new technique or block design. Our ongoing philanthropy project, QUILTS 4 KIDS, provides comfort quilts for participants in the Greenville Health System Children's Advocacy Medical Program. CHAMP provides services to victims of child abuse. When a child has his/her initial assessment, he/she is invited to choose a quilt. Child Life Specialist, Laurel Wainer assures us that the quilts have helped children become more at ease during this difficult visit. The program has added a therapy dog, Kenzie, to further comfort the children. Since initiating QUILTS 4 KIDS, we have expanded the program twice. It now includes the CHAMP program in Spartanburg and also provides quilts to young women who receive sexual assault and abuse services at The Julie Valentine Center. GMQG does not require our members to participate. We do not keep a list of who contributes quilts and do not publicly recognize those who do. We feel that it is a personal matter and that the satisfaction of providing comfort to a child is more than adequate reward. About the quilts! There are no specifications, no rules and no Quilt Police. Many of us use the quilts to practice new skills. The quilts are for comfort not a bed cover so the usual size is 45” X 45” up to about 60’ X 60” and they do not need to be perfect! Many of the blocks from Block of the Month are available for members to take home to use in a charity quilt. We are the only source for the CHAMP and Julie Valentine quilts and our generous members keep all three venues well stocked with love and comfort for those in need. Additional philanthropy projects include an occasional Quilt Drive sponsored by the Modern Quilt Guild or one of it's member guilds. Occasionally we do receive donated quilts which are distributed to other charities in which our member is active. We have a small lending library of modern quilting books. Members are welcome to borrow a book from the library and we ask that it be returned the following month. Our annual retreat is held at Wild Acres Retreat Center in Little Switzerland, NC. Please see dates and information on our Meetings and Activities Page. I am an intermeniate quilter. An advanced sewer, but retired recently and now wanting to join a guild. I currently live in Sarasota, FL, but moving to Fountain Inn the End of April to mid-May. This modern qult guild looks like what I would like be involved with. I will enjoy reading your newletters and blogs untill I settle into our new home. Thanks! We will look forward to meeting you soon. We wish you the best in your transition to South Carolina. Hi, Barbara! I moved to Simpsonville (right next door to Fountain Inn!) in January and joined the Greenville Modern Quilt Guild within the first couple of weeks here. I have spent the past couple of months visiting other local guilds and I have to say that this is my favorite group -- very welcoming and supportive and lots of fun! I encourage you to check us out when you get to the area. Good luck with your move.